Every journey starts somewhere, and my ‘curry journey’ started in the checkout queue in Tesco, Brixton. I found myself on a solo shopping trip, standing behind an elegant mother and daughter wearing saris, who were struggling to lift the biggest bag of rice I’d ever seen. I offered to help. Somehow, we got onto food – and I had to share with them the guilty fact that I’d never managed to cook a single bowl of the ambrosial rice that Indian restaurants serve in their millions. My rice was stuck in a 70s rut of British cooking: a floating, homogenous sludge that’s a million miles from the vibrant community of liberated grains that a great pilau can be. Could they help? 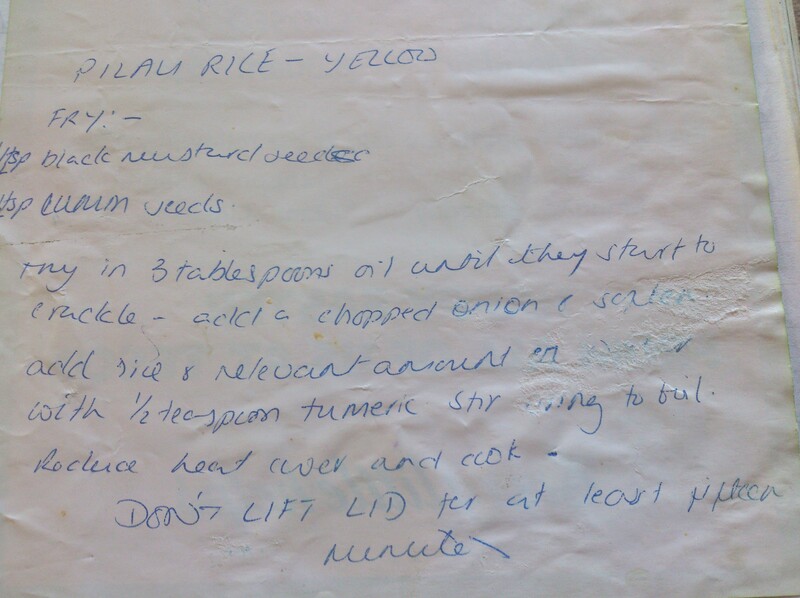 On the back of a handy Tesco flyer (‘Easter Opening Hours, April 1995′), the mother gave me the first Indian recipe I’d ever owned. 18 years later, I still have that piece of paper (pasted into a foodie diary of all the meals we shared with daughter Mia in her first year). As a family, we’ve cooked dozens, maybe hundreds of times from that Tesco flyer – and it’s never given us anything less than perfect rice for our table. Thanks to that mother and daughter in Brixton, I took the first step on a ‘curry journey’ that’s led me to own a small library of Indian recipe books, and cook countless delicious curries with family and friends. Starting this blog, I want to return the favour – to share whatever I know about Indian recipe books, ingredients, blogs and restaurants with anyone who shares my passion for curry.